The Late Rob Simonich was a master custom knife maker. Rob crafted his blades with the care and precision of an artist. My experiences with the man and his work led us into collaboration on this remarkable custom blade. Rob made the first Talonite prototype of the blade, called the "Kanji",. I took it to the Amazon jungles and used it like no other knife I’ve had. I even loaned it to the Indians for some of their work. It looks as good today as it did the day he made it for me (though there are a few scratches on the handle now). You can see this blade performing and cleaning monkeys and other animals in our Jungle Video. While I field tested the blade I came up with a couple of minor modifications that we incorporated into this final design. Though this blade is no longer available for sale through us the information could be of use to the outdoors men and collectors who have some of Robs Knives. The Talonite Blades are marked with the "Talonite" sign and each knife has Rob’s distinctive mark. The A2 blades are marked exactly the same less the "Talonite" marking. 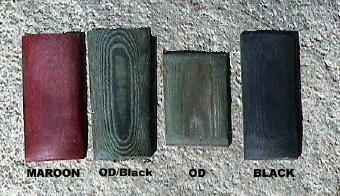 You have the choice of handle slab colors. You can choose Maroon, OD Black combo, OD and basic Black. Each knife was assigned a blade number at that time. Each knife was hand made by Rob. A2 has long been one of my favorite metals. It is tough ductile, sharpens easily, has great edge holding ability and really can’t be beat. Talonite is a Cobalt alloy. It has literally no steel in it. It has qualities unlike any other metal on the market. It cannot rust or discolor. It is also VERY expensive metal.